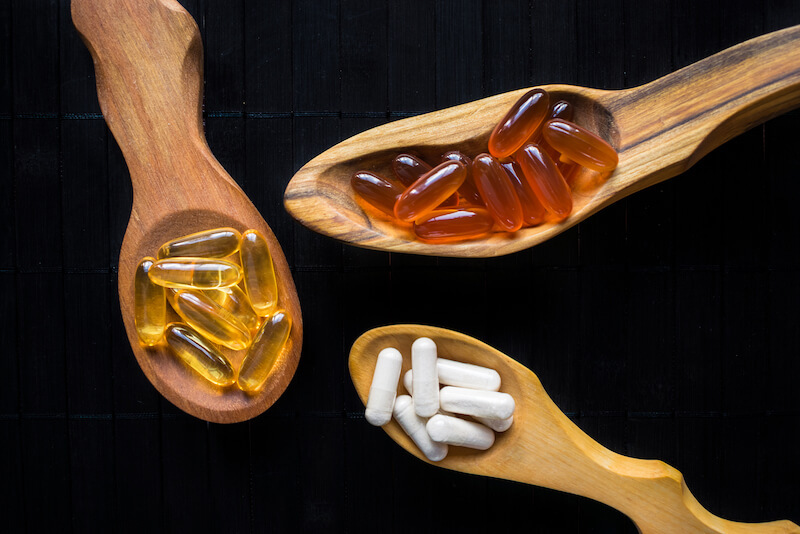 The best Halal omega 3 supplements don’t contain any ingredient prohibited by Islamic Laws such as pork gelatin and alcohol. To rank the top 10 Halal omega 3s, I checked the ingredient labels for any Haram derivatives, sought Halal Certificates, and considered the amount of omega 3s (EPA & DHA ) per serving, their purity, freshness, potency and whether they are sustainably sourced. What Are Halal Omega 3s? Omega 3 are essential fatty acids that our body can not produce by itself. So to get enough of them, we rely on fatty fish like salmon, halibut, herring, mackerel, anchovies and sardines and vegetable oils from chia seeds, flax, walnuts, camelina, rapeseed, and soya. Omega 3s are beneficial to a number of functions in the body such as our cardiovascular system and brain health. However, due to eating habits nowadays, we aren’t getting enough omega 3. And that’s where omega 3 supplements come handy. You May Ask If Omega 3s Are derived from Fish and Grain Seeds How Can They Not Be Halal? Omega 3s are usually obtained from fatty fish using various industrial separation, purification, and concentration processes. During these processes, some Haram (unlawful) ingredients like glycerin and alcohol can be used in order to separate and concentrate the EPA and DHA (the omega-3 fatty acids fats). Furthermore, most supplement manufacturers use gelatin as an outer coating for Omega 3s. And we all know, at least here in the west, that gelatin generally comes from pork. This ensures the supplement is free of pork derivatives and alcohol, so make sure there’s one on the label from a credible authority. Islam encourages people to take care of nature. In a Hadith, The Prophet (may peace be upon him) said: “There shall be no damage and no infliction of damage“. Any fish oil product that hasn’t been produced responsibly can’t be Halal. So make sure your Omega 3s are certified by environmental organizations like MSC, EDF, and the likes. The best supplement will contain 1,000mg of EPA+DHA per serving. Check the amount of EPA+DHA on the labels. Make sure the product is third-party tested for purity, efficacy, nutritional value, label accuracy, and ingredient safety. Omega 3s pills are known to oxidize and go rancid rather quickly once opened. Vitamin E is an effective antioxidant to preserve freshness. So make sure there’s one on the labels. It is generally recommended to take a minimum of 250 mg and a maximum of 3,000 mg of EPA and DHA per day with a meal to maximize absorption. If you are a regular user of Halal vitamins you probably already know Noor Vitamins brand. They manufacture a wide variety of vitamins all Halal certified. And the Omega 3 from Noor Vitamins is not left out. It’s certified by 3 authorities, Islamic Services of America (ISA), The Islamic Food and Nutrition Council of America ( IFANCA ), and the Halal Advisory Group (HAG) from Canada. While I didn’t find a third-party certificate for sustainability, the firm emphasizes the importance of sustainability and even partners with Vitamin Angels, an organization supplying lifesaving nutrients to impoverished communities. The fish is sourced from Peru and transformed in Canada using pharmaceutical grade quality and purification processes to remove mercury and ensure purity levels. Each bottle contains 60 servings of 1,200mg of Omega 3 (EPA 800+ DHA 400) and vitamin E to preserve freshness and potency. Madina Vitamins is another well-known manufacturer of Halal vitamins. Their Omega 3 supplements are Halal certified by Islamic Services of America (ISA). However, I didn’t find a third-party certificate for sustainability. 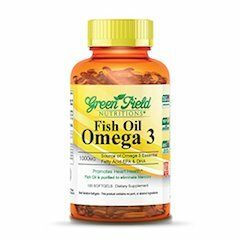 Their Omega 3 is manufactured in the USA in a GMP certified facility but has a low dose of Omega 3 (EPA+DHA) at just 300 mg. The Omega 3 comes in a bottle of 120 servings and contains vitamin E which preserve freshness and potency. 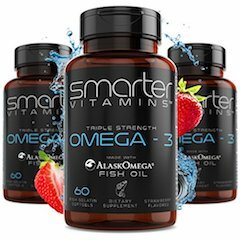 SmarterVitamins Omega 3 has one of the best amount and ratio of EPA and DHA at 1,400mg per serving. Additionally, this Omega 3 comes from AlaskOmega® which is certified sustainable and traceable by the Marine Stewardship Council (MSC). And while there’s no claim for the product to be Halal, the softgels are made from tilapia (fish) gelatin and contains non-GMO vegetable glycerin. While I didn’t find a Halal certificate for this product, New Chapter did send me a message stating that the gelatin present in their products is Halal certified by Islamic Dissemination Centre for Latin America. However, this Omega 3 is certified for sustainability from Certified Responsible Alaska Fisheries and Using Business as Force for Good. It’s also NSF tested and certified for purity and potency with no artificial flavors or sweeteners and made from wild salmon. The product contains 520 mg of Omega 3 and natural vitamin D3 and tocopherols to preserve freshness. 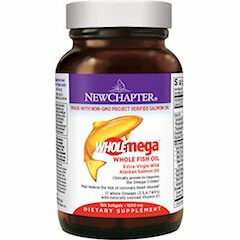 Another supplement company that produce its Omega 3 in the USA. Sweet Sunnah has an outdated Halal certificate from Islamic Centre Aechen Germany. Their certificate covers the period 2014-2015 and I reached out to ask for an up to date certificate but didn’t hear back from them so far. They do have, however, a certificate for sustainability from Friends of the Sea. Their Omega 3s come from wild caught fish and offer 600 mg of EPA+DHA in a bottle of 60 servings with vitamin E to preserve freshness. While claiming its Omega 3s are Halal, I couldn’t find a Halal certificate to back their claims and I didn’t get (yet) a reply to my message about the matter. There’s also no third-party certificate for sustainability. This product contains 600 mg of Omega 3 (EPA+DHA) and 120 softgels with vitamin E to preserve freshness. Viva Naturals is a well-known and popular brand with thousands of positive reviews. 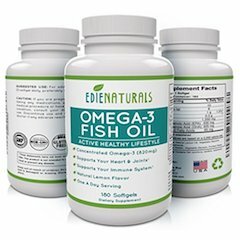 Their fish oil provides 1,400 mg EPA and 480 mg DHA, one of the highest omega 3 and ratios we’ve seen with vitamin E to preserve freshness and potency and with no artificial colors or sweeteners. They are also third-party certified for purity and sustainability and have a 5 star from IFOS. A Halal certificate is the only thing missing to make this omega 3 our best choice. However, they do claim to use Halal gelatin for their pills. I didn’t find enough information on the label of this Omega 3 nor did I find a Halal certificate or a third-party certificate to back the claim of this manufacturer. The fish oil contains 300 mg of Omega 3 (EPA= DHA) with vitamin D3 and vitamin E to preserve freshness. EdieNaturals offers a bottle of 180 servings. Each serving contains 755 mg of Omega 3 (EPA+DHA) with natural tocopherols to preserve freshness. The product is made in the USA and in a GMP certified facility and claims to be Halal and Kosher friendly, though I didn’t find any certificate. VitaNutritions offers a container of 90 servings of highly concentrated Omega 3 with 900 EPA and 600 DHA. The omega 3 has a natural lemon flavor and no artificial sweeteners or colors. The manufacturer says that their product is Halal and Kosher but I didn’t find any certificate to back this claim nor did I find any third-party certificate for sustainability or purity. Our best choice is NoorVitamins Omega 3 Fish Oil as it’s got 3 Halal certificates, has one of the best quantity and ratio of EPA+DHA and comes at a good price. I’ll be adding to this list as I discover new Halal Omega 3 Supplements. I’ll also add any additional information such as Halal Certificates and third-party certificates regarding purity and sustainability. If you know about any Halal Omega 3 brand I didn’t include in this review, please let me know in the comment section below. If you find this article helpful please give a like or a share and help me spread the word. 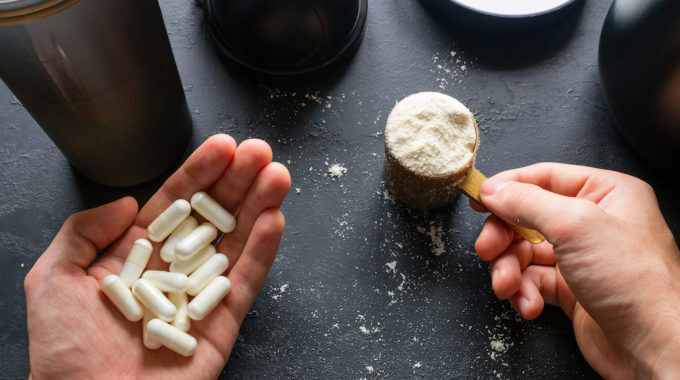 previous post: What Is the Best Creatine Supplement of 2019?